Are Diabetes and Insulin Resistance Reversible? The Facts. THE MEDICAL PROFESSION WOULD have you believe that diabetes is not reversible and only controlling your blood sugar with drugs or insulin will protect you from organ damage and death. But medication and insulin can actually increase your risk of getting a heart attack or dying. The diabetes epidemic is accelerating along with the obesity epidemic, and what you are not hearing about is another way to treat it. Type 2 diabetes, or what was once called adult onset diabetes, is increasing worldwide and now affects nearly 100 million people — and over 20 million Americans. We are seeing increasing rates of Type 2 diabetes, especially in children, which has increased over 1,000 percent in the last decade and was unknown before this generation. One in three children born today will have diabetes in their lifetime. Yet this is an entirely preventable lifestyle disease. In a report in The New England Journal of Medicine, Walter Willett, MD, PhD, and his colleagues from the Harvard School of Public Health demonstrated that 91 percent of all Type 2 diabetes cases could be prevented through improvements lifestyle and diet. Here, I want to review in detail this new way of thinking about diabetes and outline the tests I recommend to identify problems with blood sugar. Next I’ll tell you exactly how to prevent, treat, and reverse Type 2 diabetes. Diabetes is often undiagnosed until its later stages. Insulin resistance, when the body becomes resistant to the effects of insulin, is primarily what causes diabetes. When your diet is full of empty calories, an abundance of quickly absorbed sugars and carbohydrates (bread, pasta, rice, potatoes, etc. ), the body slowly becomes resistant to the effects of insulin and needs more to do the same job of keeping your blood sugar even. High insulin levels are the first sign of a problem. The high insulin leads to an appetite that is out of control, and increasing weight gain around the belly. High levels of insulin are warning signs — they precede Type 2 diabetes by decades. Insulin resistance and the metabolic syndrome associated with it is often accompanied by increasing central obesity, fatigue after meals, sugar cravings, high triglycerides, low HDL, high blood pressure, problems with blood clotting, as well as increased inflammation. These clues can often be picked up decades before anyone ever gets diabetes — and may help you prevent diabetes entirely. If you have a family history of obesity (especially around the belly), diabetes, early heart disease, or even dementia you are even more prone to this problem. Most people know about the common complications of diabetes such as heart attacks, strokes, amputations, blindness, kidney failure, and nerve damage. Some may even know that it increases your risk of dementia and cancers and can cause impotence. Diabetes and pre-diabetes ARE reversible by aggressively changing lifestyle, nutritional support, and occasionally medications. But most people don’t realize that insulin resistance or pre-diabetes can be just as bad causing heart attacks, strokes, dementia, cancer, and impotence — decades before you get diabetes. In fact many people with pre-diabetes never get diabetes, but they are at severe risk just the same. We were highly adapted to a nutrient-dense, low-sugar, high-fiber diet rich in omega-3 fats. But when we eat out of harmony with our genes, we turn on genes that promote diabetes. Take Arizona’s Pima Indians, for example. They were thin and fit 100 years ago, living on a diet of over 70 percent carbohydrates. They ate high-fiber, unprocessed plant foods and they had no diabetes or obesity. Now, in just one generation, they are nearly all obese and 80 percent have diabetes by the time they are 30 years old! That’s because they are eating food that turns on all the wrong gene messages — foods like sugar, trans fats, white flour, and processed foods. Diabetes and pre-diabetes ARE reversible. New science shows that it’s possible, through an aggressive approach of lifestyle, nutritional support, and occasionally medications. It is important to diagnose Type 2 diabetes early, but it is often not diagnosed until very late. In fact, all doctors should aggressively diagnose pre-diabetes decades before diabetes occurs, and before any damage is done to your body. Damage begins with even slight changes in insulin and blood sugar. Unfortunately, there is a continuum of risk from slightly abnormal insulin and blood sugar to full blown diabetes. This should be addressed as early as possible on the continuum. In a recent study, anyone with a fasting blood sugar of over 87 was at increased risk of diabetes. The lowest risk group had a blood sugar less than 81. Most doctors are not concerned until the blood sugar is over 110 — or worse, over 126, which is diabetes. Therefore, I recommend early testing with anyone who has a family history of Type 2 diabetes, central abdominal weight gain or abnormal cholesterol. Don’t wait until your sugar is high. 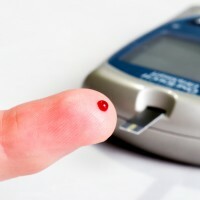 Insulin Glucose Challenge Test – This should be done with a 2-hour glucose challenge, 75 grams measuring fasting, 1- and 2-hour blood sugar AND insulin. Your blood sugar should be less than 80 fasting and never rise above 110 or 120 after one to two hours. Your insulin should be less than 5 fasting and should never rise above 30 after one to two hours. I recommend this test for everyone over 50, and for anyone with any risk of insulin resistance, even children. Hemoglobin A1C Test – This is an important measure of glycated hemoglobin, which can be an early indicator of sugar problems. It measures sugars and proteins combining into glycated proteins called AGEs (advanced glycation end products), like the crust on bread, or the crispy top on creme brule. These create inflammation and oxidative stress throughout the body, and promote heart disease and dementia and accelerating aging. The hemoglobin A1C should ideally be less than 5.5. Anything over 6 is considered diabetes. Lipid Profiles – These are also important. An HDL or good cholesterol level under 60 and triglycerides over 100 should make you suspicious of insulin resistance. An HDL under 40 and a triglyceride level over 150 usually means diabetes. NMR Lipid Profile – This test is slightly different from the one above as it identifies the size of your cholesterol particles. With insulin resistance or Type 2 diabetes, you develop small LDL and HDL cholesterol particles. They are much more dangerous than larger particles and lead to increased risk of atherosclerosis or heart disease. High Sensitivity C-Reactive Protein Test – This is a measure of inflammation, one of the classic conditions that is both the cause and result of insulin resistance and diabetes. It should be less than 1, and is often associated with diabetes. In fact, anyone with a high C-reactive protein has a 1,700 percent increased risk of getting diabetes. Homocysteine Test – Homocysteine levels are often abnormal in people with diabetes. The test is a measure of folic acid deficiency. It should be between 6 and 8. Fibrinogen Test – This measures your risk of clotting, which can cause heart attacks and strokes. It is also a sign of inflammation and is associated with insulin resistance and diabetes. It should be less than 300. Check Ferritin Levels – These are often elevated in people with diabetes. It is a nonspecific marker of inflammation associated with the disease. It also can mean an overload of iron in the body. It should be less than 150. Uric Acid Test – Your level should be less than 6. Higher levels indicate problems with insulin resistance. This can lead to gout, which is related to insulin resistance and Type 2 diabetes. Liver Function Tests – Elevated liver function can result from insulin resistance. This is the major cause of fatty liver and elevated liver function in this country. This is entirely due to sugar and carbohydrates in our diet that cause fatty liver, liver damage, and even cirrhosis. These are tests any doctor can perform and are covered by insurance. In another blog, I will tell you how to prevent, treat, and even reverse diabetes. I have seen this hundreds of times in my patients and there is no reason you can’t achieve the same thing if you apply these principles. Have you been diagnosed with pre-diabetes or diabetes? Have you been told that it is irreversible? What steps have you taken to prevent diabetes? Please leave your thoughts by adding a comment below – but remember, we can’t offer personal medical advice online, so be sure to limit your comments to those about taking back our health!